I know, there is an umpteen page thread on this, but rather complicated, in the weeds. I now have a C6, manual. I like it. My wife use to drive stick, but not lately, not confidently. I was kinda’ thinking of a C7 auto, but with all the reported problems, and the C8 coming (soon I hope), I am thinking the DCT will fit the bill. I drove my brother-in-law’s VW GTI with I believe to be a DCT. It was totally automatic when left alone, or shifted with the paddles. (I really did not like it, but that may have because of the lack of power.). Is the DCT expected on the C8 fully automatic when wanted (in addition to the paddles)? If I did not like it in the GTI, would I still not like it in the C8? I know it is subjective, but those in the same boat, I would like to hear your thoughts. Here are a couple of good videos to help you learn more about how the DCT works. Thanks to “fasttoys1” for sending them my way when I asked him similar questions a few weeks ago. I understand the basic functionality of the dct. Those videos helped. What I don’t understand is if ,for instance,when you are in third gear. Fourth gear is already “pre selected” so the upshift to fourth is much faster. What I don’t understand is what if you want to down shift?and the even gear side already has fourth pre selected and I want to go to second? Drive the GTI again and ignore the power. Pay attention to how fast and smooth it shifts, how fast the paddles react. Put it in Sport mode, come into a corner at a high speed, brake, turn in and get back on the gas. Pay attention that entire time the trans did everything it should have done, instantly. No TC trans is going to mimic it. I spent a portion of the summer driving a '17 GTI and the trans was excellent. The FWD sucked but if you filter everything you you'll notice the difference. I have a Audi B9 S4 on order which switched to a TC trans but my wife's new Audi B9 A5 convertible with have a DCT...go figure. Last edited by NoOne; 01-20-2018 at 11:31 PM. I remember driving the GTI with the dct and not being impressed either. Go test drive a Porsche with its pdk..it's pretty impressive and Porsche dealers love when you call up ahead of times to go for a test drive.. Chose the boxster s or cayman s both with dct s..
That will help you decide..
Just don't end up driving off with a new Porsche .. I don't think we know which DCT will be used. The CAD drawings looked to be very similar to the ZF transaxle used in the Porsche. Driven them both, quite a bit. From a functional and dynamic standpoint its the same experience. The "PDK" in the Macan is actually an Audi DSG box. You might want to tell those smart folks that the Tremec 9007 is not a transaxle, instead it's for front-engine rear-drive applications. It's a year away, so I'd imagine a Tremec transaxle could still show up in some form. The cad renderings show a transaxle almost identical to a ZF Porsche unit though. Last edited by RedLS6; 01-21-2018 at 04:03 PM. Thank you. If the ZF, here is a video on how it operates, and as it was produced by ZF, touts its enhancements. Almost always there is more time for downshifting than for upshifting. When upshifting, keeping the shift delay minimal improves performance. When downshifting, in any competitive environment, braking is going on. So two things happen here. The DCT can un pre-select the upshift gear when the throttle pedal is lifted, making both upshifts slower but downshifts a bit faster. When the brakes are applied, the DCT can pre-select the downshift gear for faster downshifting. So, by watching your feet, the DCT can out-guess you most of the time. So the literature is wrong? Says modular design including transaxle. I’ve also heard from a source it’s goong in the ME vette and upcoming GT500. Nope the literature is not wrong, u are right, looks like they have modularized the original 9007 to include a transaxle. I'm curious as to some of the sources of this rumor - the CAD drawings clearly do not show a Tremec 9007, as pictured in Tremec's literature. They show what appears to be a ZF unit. Like Joe said above though, none of us really know what it is. The part circled in red, below, shows the commonality between the CAD drawings and a ZF Porsche unit. The lower pic, under the CAD drawing, is a ZF Porsche PDK architecture used in a transaxle (the transaxle shaft is not shown). They sure do look alike, right down to the number of fasteners holding the top cover on. Either way, I'll probably be happy with the transmission selection. Last edited by RedLS6; 01-22-2018 at 10:39 AM. it shifts lightning quick at the flick of a switch. i bet your wife will love it, because if she drove a stick, she understands the principle of shifting gears, and the dct does it better. an interesting question will be how long the clutches last. I'm curious as to some of the sources of this rumor - the CAD drawings clearly do not show a Tremec 9007, as pictured in Tremec's literature. They show what appears to be a ZF unit. It sure does look similar. I’m definitely not an expert on cad files though. What I know is GM has had a long standing relationship with tremac and I’ve heard from people that’s what’s going in. Like you said though I don’t think either will disappoint us. It really is subjective, down to the exact transmission. My previous Vettes have all been manuals. I drove a friend's automatic C6 with the 6-speed auto at the track one day, and hated the A6 auto. My current car is a C7Z with the A8 auto, and it's by far my favorite transmission - I like it even better than my previous manuals. 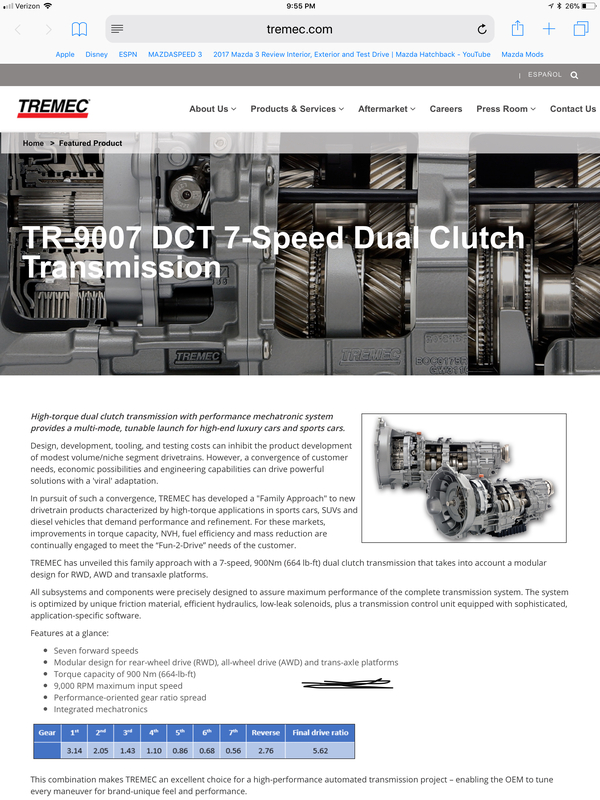 A DCT is basically an automatic transmission when in "Drive" .... and it "should" offer quick response when in "Manual". The clutches offer a direct mechanical connection between the engine and rear wheels when engaged, but they do need to slip slightly when launching and shifting. If you really enjoy pushing a clutch with your left foot, then you may not like it. For me, I enjoy shifting with my hands, and I'm a left-foot braker, so the paddle architecture was easy for me to adapt to and enjoy. I do occasionally miss heel-toe, as I used to do it everywhere, street and track. YMMV. Last edited by RedLS6; 01-22-2018 at 11:03 AM. Then there will be a slight additional action required, as the transmission must now mechanically change its selection from "fourth" to "second", before completing the clutch action. You may not notice the delay though. Electronic controls and algorithms can help mitigate this too .. suppose you're heading down a straightaway at full throttle, and you shift 1,2,3 ..... and the transmission prepares to go into 4. However, you hit the brakes for the corner at the end of the straight, and then tap the downshift to 2. If the controller sensed your braking, then it'll be ready for a 2 downshift. You can always fool it into being in the wrong gear, but those cases are not as likely. Last edited by RedLS6; 01-22-2018 at 11:16 AM. Basically, it is an automated manual transmission. No torque converter in the power path so other than when shifting the transmission is always directly coupled to the flywheel just line in a manual transmission. 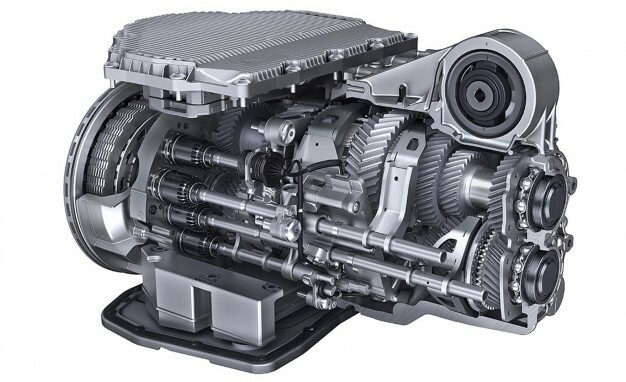 Slush box automatics have the torque converter in the loop and you have am indirect connection from the flywheel to the transmission (although when in the higher gears the torque converter clutch will engage to provide direct power flow). The shift mechanism moves from the floor to the steering column and the clutch is eliminated.